In today’s era where the real estate sector is growing at a rapid rate and the regulator are working hard to solve the issues faced by both the home buyers and the builders. The Gurugram RERA known as H-RERA is about issue a notification for the builder who are trying attracts the home buyers by making an offer of ‘Assured Returns’. Quoting the SEBI Regulations where the scheme of assured returns was declared as illegal and fraud scheme, the officials of the H-RERA said that such offers by the builders are fraud and illegal. In several cases involving the Assured Returns schemes the H-RERA authority has already refused the remedy to the complainant, further the police authority also reported that the they have received number of complaints about the assured return projects and they have also registered 2 FIR based in those complaints and further investigations are being carried out. But one of the home buyers have claimed that police is not taking any actions on such builders who are using such schemes to attract the buyers. 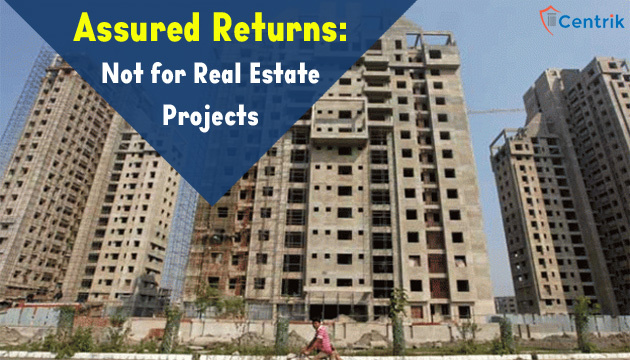 The builders are setting up an ambush against home buyers using the scheme of assured returns where the investors in real estate projects are assured a fixed rental income which can go upto 12%. Now the H-RERA Authority is making a list of all such builders to file a suo-moto criminal complaint with the Police Authorities for the charge of cheating and misrepresentation. The officials further claimed that the list of real estate agents will also be prepared who are indulged in buyuing and selling of projects of such companies and will be charged for unfair practices. The officials have further added that “If a developer insists on their project be sold as promising assured returns, agents should approach H-RERA. The authority will probe the complaint, and if a developer is found guilty of such practice, their registration will be cancelled”. The H-RERA Chairman advised the builders not to use such schemes as even SEBI has categories these schemes as purely an investment scheme and not a real estate project. He further advised the buyers to invest in such schemes at their own risk. Looking the Real Estate (Regulation and Development) Act, 2016 and the RERA rules, such schemes act as a violator of the provision and rules. Majority of Builders are crook. Investor or home buyer should not fall prey to such. Before investing hard earned money in the so-called lucrative investment take help of professional who can verify the authenticity and viability of the project. Right from the sanction of the project till final handover and registration, every step needs care full legal scrutiny.